IT Works Internet Review 2019: Is IT Works Internet a Good Hosting? Based in Singapore and operating under the Vodien Group, IT Works Internet (IWI) is an expert in building highly successful e-commerce businesses. It provides hosting solutions for websites and email, server colocation, security, and connectivity, and is backed by 24/7 support. Founded in 2002, IT Works Internet (IWI), a brand under the Vodien Group, is a web hosting vendor and an Internet services provider based in Singapore. It offers versatile, reliable, and affordable web hosting services using data centers in Singapore, Australia, and the U.S. It currently serves over 35,000 businesses and 230,000 users worldwide. The website is available in English. IWI provides a comprehensive set of Internet services that includes cloud web hosting, server co-location, dedicated servers, email hosting, VPS, reseller hosting, domain name services, web design, and development. The web hosting has high security. Every hosting account comes with a malware scanner that scans website files every day. Added to that is a malware sentry that auto protects users from malicious attempts to hack into their websites. Another nice feature is the brute force sentry. One thing that WordPress websites get easily is hacking attempts. That’s because it’s easy for anyone to know that a website is on WordPress(WP). With the brute force sentry, brute force hacking attempts are stopped, and your WP website and login section are automatically protected. With VPS, customers get a cPanel host manager and a content delivery network (CDN). The CDN ensures fast load time regardless of where your customer is located. That’s because a copy of your files is shared across several networks and your customer gets information from the network closest to them. As part of giving back to society, IWI supports non-profit websites for their hosting needs and server co-location. The starter web hosting plan offers you 5,000MB total space, five MySQL databases, and ten email addresses. The pricing is fair when you compare it to what the package offers. IWI also has three other plans with more features and slightly higher prices. Also, if you want a simple one-page website with one or two email accounts at a lower price, a custom-built package that suits your needs can be prepared. There is no free SSL certificate on offer, but you do get a free domain name on annual subscription. There is a seven-day money-back guarantee, though that’s not really enough time to assess the service. The support team is accessible through support ticket, email, phone, and live chat. Its knowledge base has general and technical FAQs with pictorial tutorials. I used the live chat, and their response was commendable. The customer service agent ensured I was satisfied and even went ahead to create a support ticket and forward my request to another professional when I wasn’t. 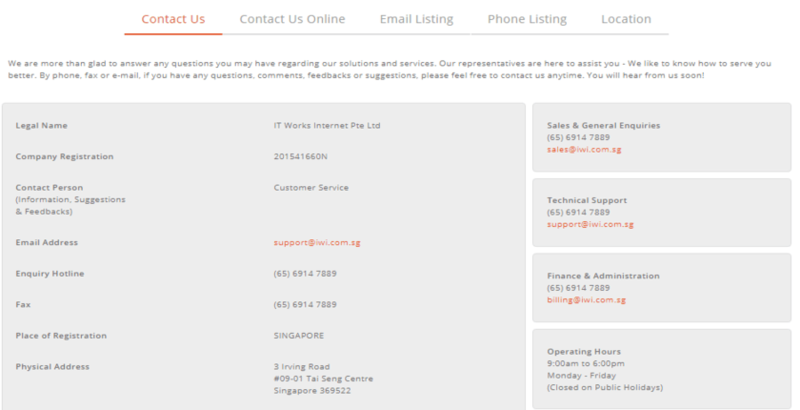 IT Works Internet is one of Singapore’s leaders in web hosting solutions. Each web hosting plan offers optimum reliability, amazing speed and performance, generous disk space, and 24/7 customer support ready to help you with any hosting-related concerns. Wondering how IT Works Internet stacks up against other Web Hosting companies? Enter any other Web Hosting company and we will give you a side-by-side comparison.